Choi & Lager is one of the few galleries in Cologne to strongly focus on Korean art. 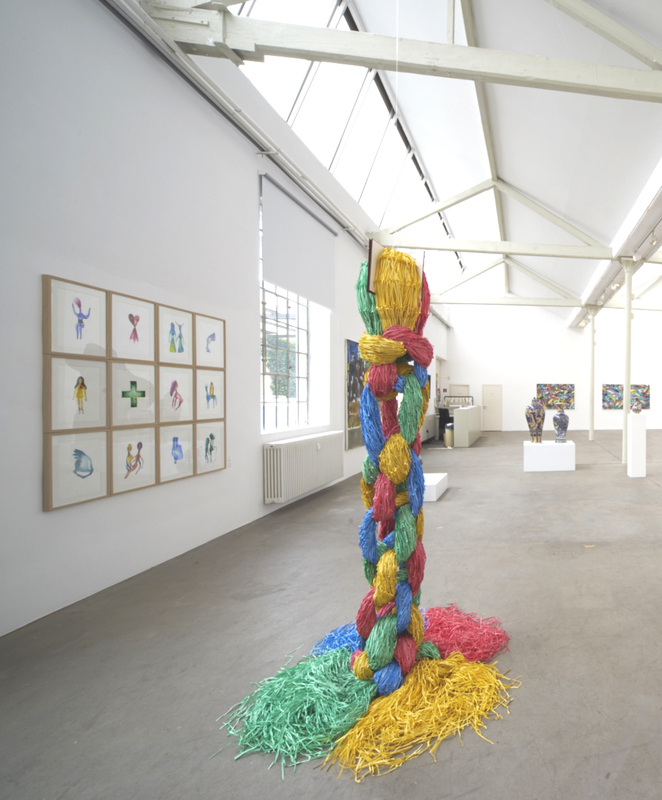 It was founded in 2006 by Jari Lager and sisters Sunhee and Jinhee Choi who having been working together for over a decade to promote Korean artists within Europe. 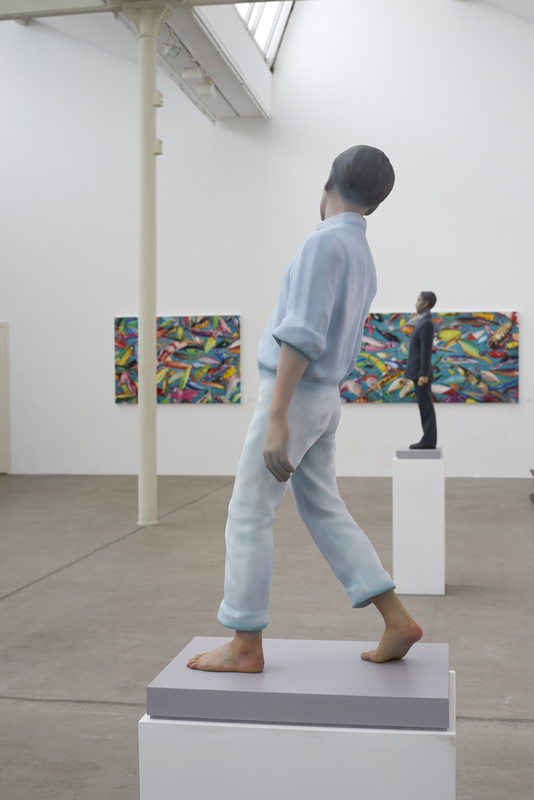 Their latest exhibition is their most ambitious to date, currently on view in the Michael Horbach Foundation, ‘Have A Good Day Mr Kim!’, features 15 Korean contemporary artists who have all caught the eye of the gallery team at some point during the last ten years. The show presents a wealth of talent from both established and emerging Korean artists, pushing to the forefront a nation whose art scene is still striving for international status. Frederica Miller: Why is it important for Choi & Lager to promote contemporary Korean art within Europe? Jinhee Choi: Because we, I mean Jari Lager, Sunhee Choi and I, are firm believers in the quality of Korean contemporary art and the sad reality is that there is still little opportunity for Korean artists to gain international recognition. Since 2002 we have come across a wealth of Korean contemporary artists however there are still few galleries or institutions that support and promote them in The West. That is the reason why we decided to show so many artists in this latest exhibition, we even had to narrow the numbers down from the original list. Having been brought up in Korea and now living in Europe Sunhee and I feel a duty to promote these artists and together with Jari, who has a deep interest and passion for Korean art, we aim to bridge the gap between Korea and Europe. 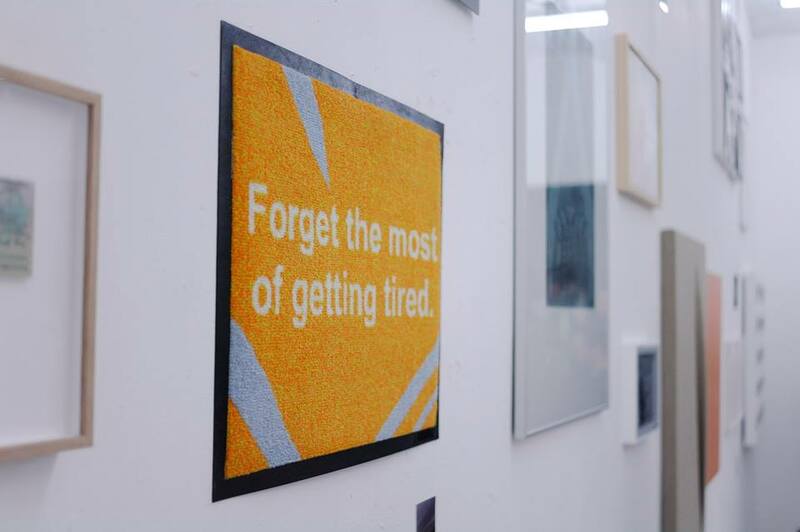 Frederica Miller: The exhibition’s title ‘Have A Good Day, Mr. Kim!’ suggests a sense of ironic self-reflectivity, would you say that this is a common attitude amongst current Korean artists? Jinhee Choi: Of course it is an ironic title that contains a lot of interpretations. 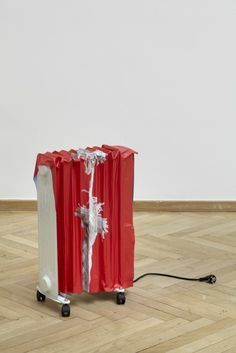 Hyungkoo Lee is a good example of an artist that deals with this theme of self-reflectivity, his work ‘Ridicularis’ that we have included in the show was inspired by the time that he spent studying in The States. Coming to The US from Korea he was immediately struck by how animated people were; their body language and gestures were larger than he was used to. Feeling shy and overwhelmed his initial reaction was to make himself a pair of oversized hands to wear, like a cartoon. He then began to consider what cartoons would look like if they had human or animal anatomy which is how he began his ‘Animatus’ series. This piece was shown in the Korean pavilion at the 2007 Venice Biennale and it’s a good example of a Korean artist reflecting on the culture shock that he and many Koreans experience when working or studying abroad. Frederica Miller: Going back to the title why did you choose Xooang Choi’s sculpture as the main image for the exhibition? 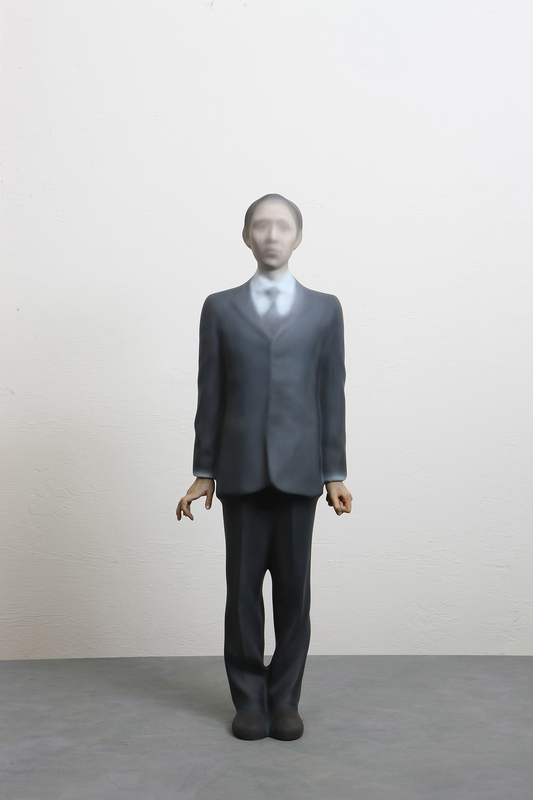 Jinhee Choi: We chose this sculpture because it fits precisely to the title and concept of the exhibition.The sculpture looks exactly like ‘Mr Kim’ that is to say the everyday Korean businessman; the man that you see on the subway or in the street. The figure’s blurred face and the tense body language symbolises the kind of anonymity, that comes from living in a big metropole and working hard. Korea is one of the hardest working countries in the OECD ranking, so the tension that you see in his hands is very real. Korea has developed at an unbelievable speed over the last years and every Korean individual is somehow suffering the consequences of this rapid development. We chose this sculpture because whilst it represents the everyday reality of Koreans it simultaneously represents all people suffering under societal pressures regardless as to where they live. Frederica Miller: What kind of social problems are people in Korea currently experiencing? Jinhee Choi: There is a lot of competition amongst people, it begins from childhood upwards; you have to be polite to your parents, you have to get good grades at school, and then you have to get a good position at work. There are a lot of traditional duties as well as social pressure from modern society. A common problem is that you have to work so much that you seldom have free time for yourself. So you are in a very strained society but you have no time to yourself to think about it. Frederica Miller: And how do artists fit into this ‘strained society’? Jinhee Choi: I would say that they have a particular role and a particular reputation in Korea. Artists are very respected people. Although there is also definitely a strong sense of competition amongst Korean artists. In terms of society artists have an important role, the Korean people don’t generally have time to reflect on their life or their circumstances, whereas artists always pose the questions: What’s going on? What are you doing? What is the meaning of your life? And because of this it’s especially important to have those artists in Korea. Frederica Miller: The exhibition represents a mix of artists; some have studied in Korea and others in Europe, seeing as the show includes artists working from both these places, do you see a difference in the practice and concerns of the artists depending on where they are based? Jinhee Choi: Firstly there are a lot of Korean artists in Europe and because we are located here we got to know them more easily than Korean artists based only in Korea. That said, we strongly believe that such artists can produce really interesting work because they have experienced several identities. They have grown up in Korea but they have accepted and adapted to European culture. Although in many ways they are not different from contemporary European artists there is still something inherently Korean about their work. 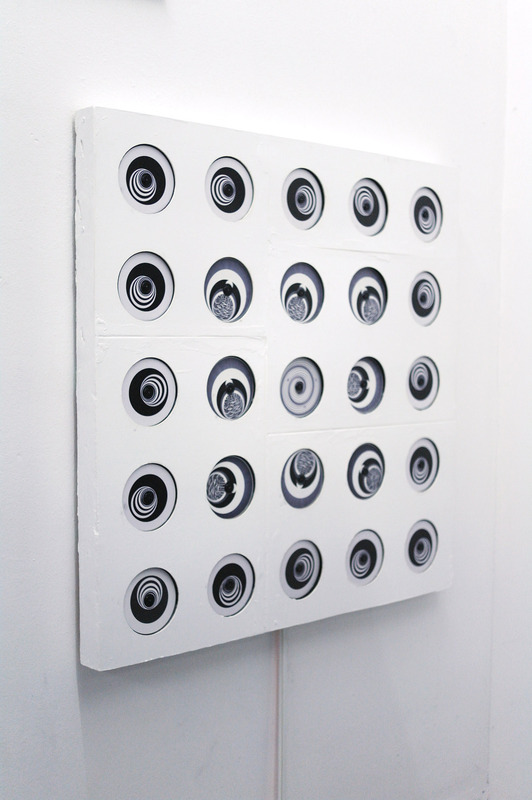 Frederica Miller: Could you explain to me the work of Paris-based artist Stella Sujun within this context? Jinhee Choi: Stella Sujun is one of the youngest artists in this show and has a lot of potential to grow. Her watercolour series ‘The Sick Rose’ is an immediate reference to European culture as it takes its title from a William Blake poem. 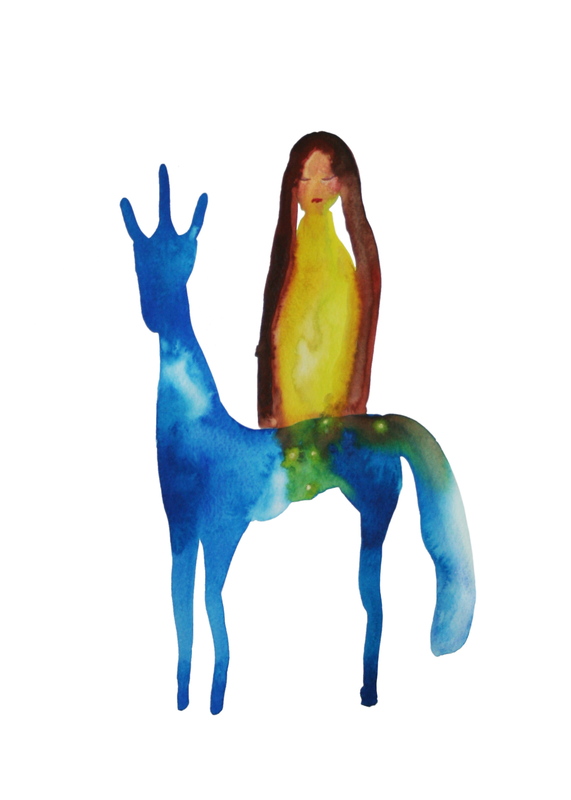 The medium of watercolour is also not a Korean tradition. On the other hand there is a meticulousness to her work that could be understood as distinctly Korean. She worked on this project daily, producing 200 watercolours in total, so the ones that you see here are the selected few. Furthermore her pictures contain a mix of self-made symbols and mythologies that seem to be influenced by both Eastern and Western cultures. She also deals with anatomy, sickness and surgery, themes linked to a car crash that she experienced as a child. One of the reasons that we have chosen to promote Korean artists like Stella is that they work very precisely. As you can see the finish to the works on display here are almost perfect and that is important for Korean artists. The interesting thing about artists like Stella who have studied outside of Korea is that as well as being concerned with perfect presentation they have also accepted a free European style of painting or drawing, and therefore they possess a powerful mix of influences from these two cultures. Frederica Miller: The relationship between North and South Korea is notoriously tense, a tension that artist Seahyun Lee seems to explore in his bright red landscape paintings, please can you explain the process behind these works? Jinhee Choi: Every man Korea has to do two years of military service, and Seahyun Lee did his at the border between North and South Korea. Every night it was his duty to keep watch on the border with infrared-binoculars. He found the landscape so beautiful and so calm in the infrared light, that despite the official war between North and South Korea this untouched zone made him nostalgic for the countryside that he had grown up in. After his military service he began to paint the landscape that he had seen whilst on duty. 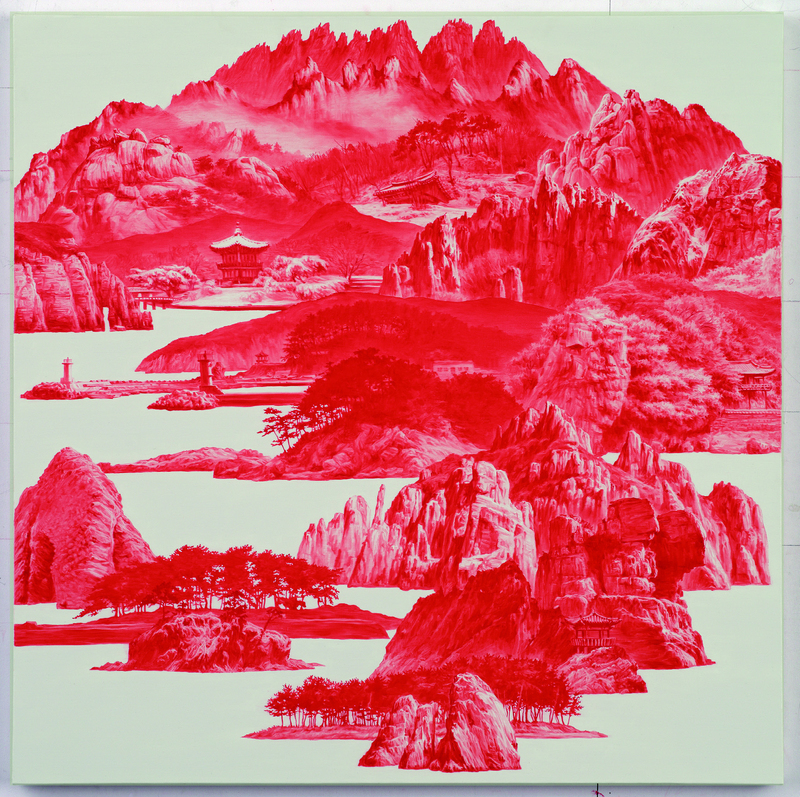 Although the mountains of North and South Korea are idyllically depicted in his paintings the remarkable red adds an aspect of critical disquiet to the works. Frederica Miller: As someone dealing with Korean artists what do you know, if anything, about the existence of an art scene in North Korea? Frederica Miller: Where do you see ‘Have a good day Mr.Kim!’ going? Are you hoping to take the exhibition elsewhere in the future? Jinhee Choi: Yes. We are very proud to say that ‘Have a good day Mr.Kim!’ will be on view at Vestfossen Kunstmuseum, Norway in an extended scale next year. We are keen to promote these artists as much as possible across Europe, and in the future we also hope to be able to show it at a German Kunstverein. ‘Walking the line’ is an annual group exhibition put on by Galerie Martin Kudlek. 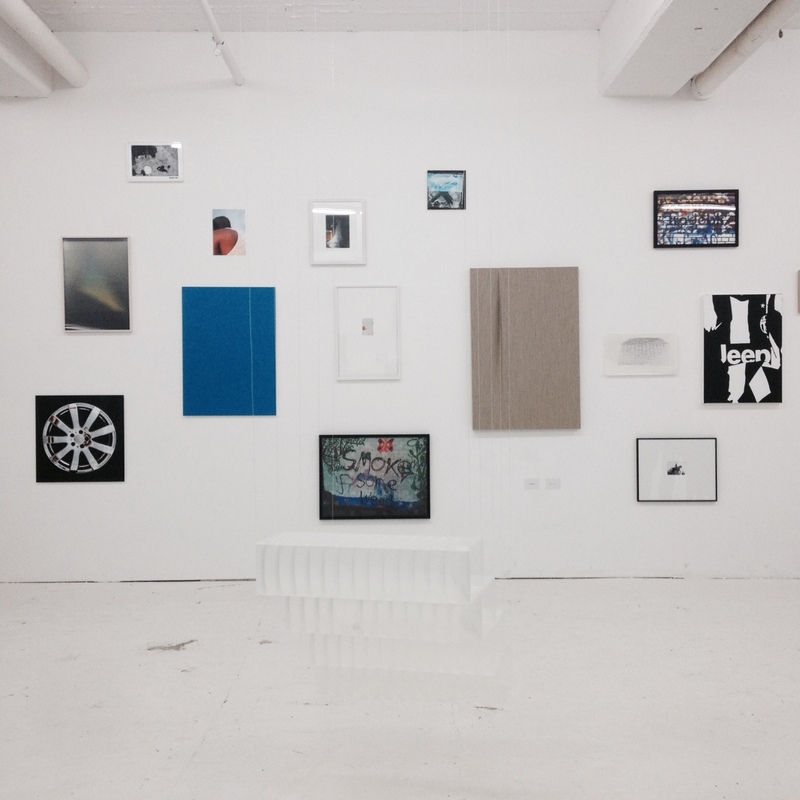 Now in its sixth year the show contains work from 9 new artists who have each made an impression on the gallerist’s mind over the last 12 months. The stylistic diversity of the pieces on display is set off by uneven and inconsistent framing which, whilst unorthodox, ultimately works to compliment the unique aspects of each. 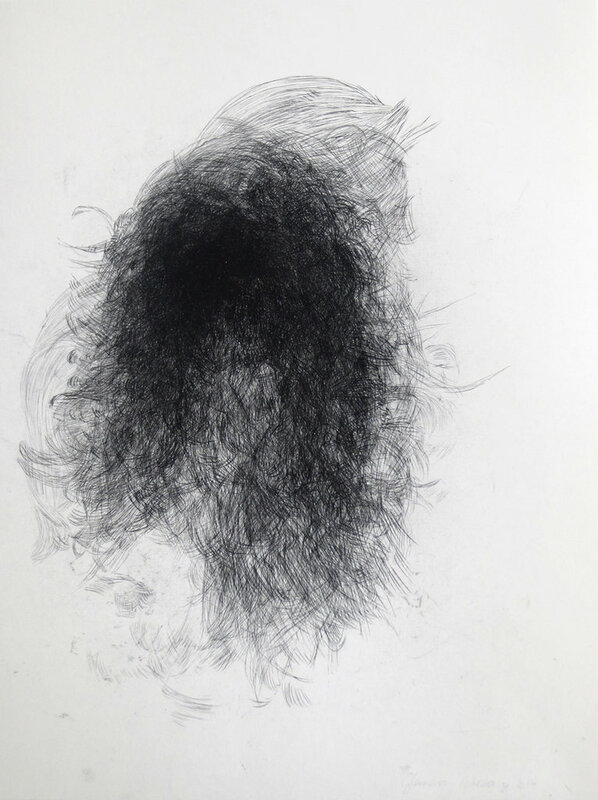 Hedwig Brouckaert is a Belgian artist who creates work with tracing-paper and carbon pencil; taking advertising images from magazines and elements such as hair she transfers a variety of forms on top of one another, until their outlines morph into multi-layered masses. The result is simultaneously chaotic and strikingly fragile. The works featured in the exhibition give the impression of wind-tussled haystacks whose kinetic contours and submerged silhouettes assuredly draw the eye in. The drawings of Dutch artist Hans Lemmen maintain this enticing quality. Putting ink and Casein paint to paper Lemmen creates dream-like depictions of figures and landscapes that teeter on the point of the grotesque. 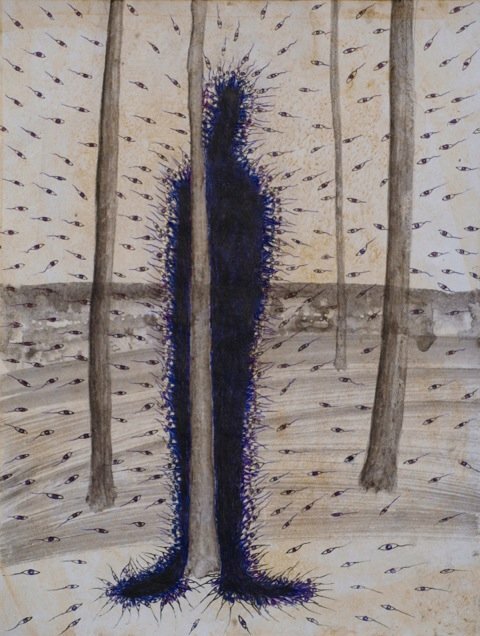 The artist uses dark colours and intense detail to depict macabre subjects; one work, which is drawn upon yellowed paper, features a body being pecked at by crows. Lemmen’s work is skilfully bizarre, he draws eerie matter with such delicate detail that the humour behind it is not lost on the viewer. Across the gallery hang works from Katrin Bremermann. 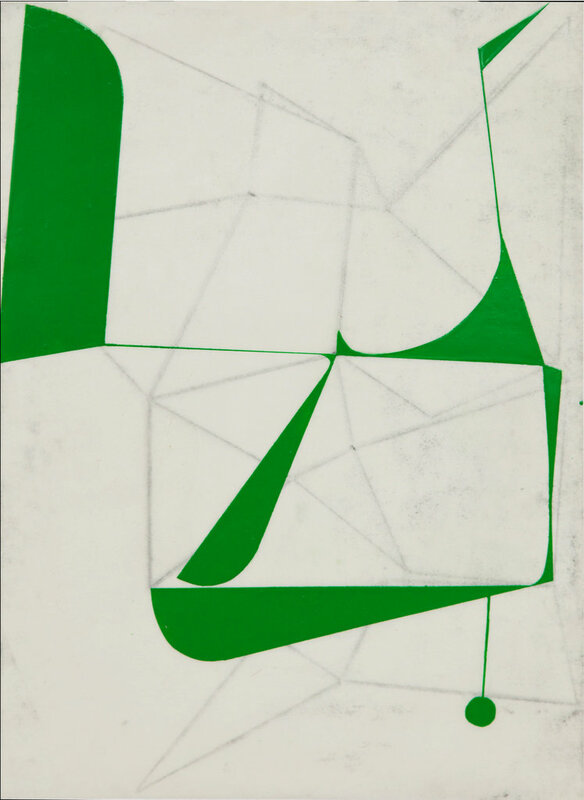 Using a range of brightly coloured varnishes on paper the artist plays with the possibility of form. Each work is a geometrical frame, the coloured varnish is applied in exact lines and points across the page. These strong outlines create new spaces in which the eye can wander. Bremermann’s work is wonderfully balanced, the underlying pencil lines visible in a few of the works demonstrate the precision of her practice. Although accurate her strict lines feel far from stilted, they draw the viewer in to discovering further forms and new organic shapes. ‘Walking the line VI’ eschews conventional curating in order to showcase the work of 9 very individual artists. An honest display of talent it offers an enlightening alternative to the ‘concept-conscious’ group show. Last night mixed-media artist of the moment Nina Beier spoke about her practice at The Kölnischer Kunstverein. Born in 1975, the Dane began her career in London and is now based in Berlin. 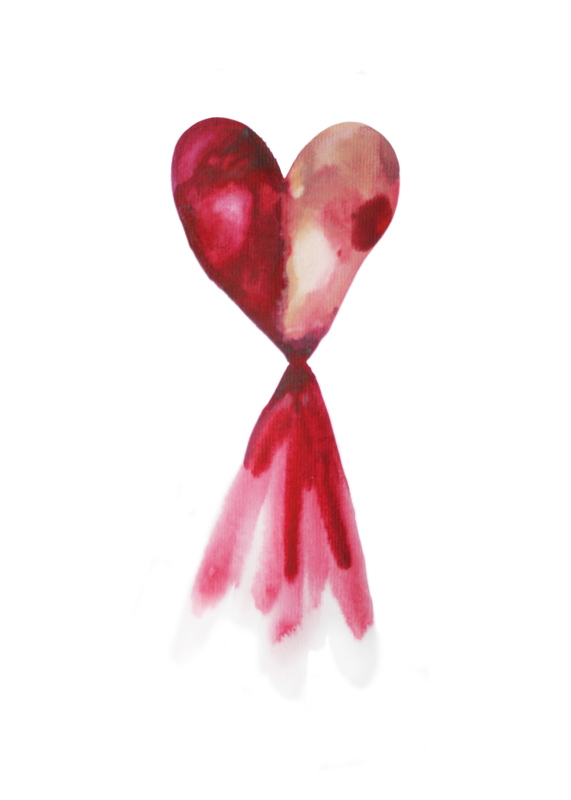 Since 2010 her work has been lauded for it’s aesthetically fluent yet thought-provoking nature. A fan of the found object Beier has employed everything from Persian rugs to banknote beach towels in order to confront the theme of time in her work. Beier eloquently spoke about taking inspiration from internet stock images, the anonymity and agelessness of which have prompted her to realise them in her art, giving physical substance to things that might have otherwise been lost or forgotten in our self-deleting digital age. 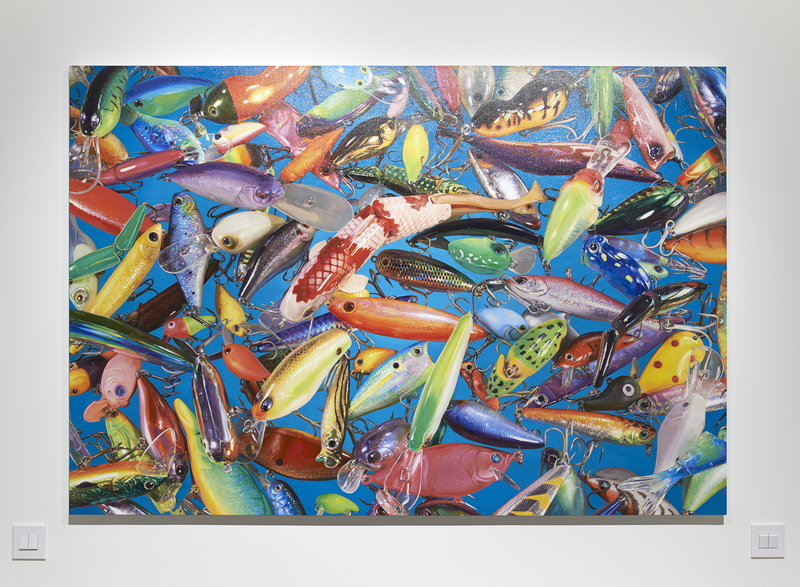 Beier reproduces these stock images in various formats. 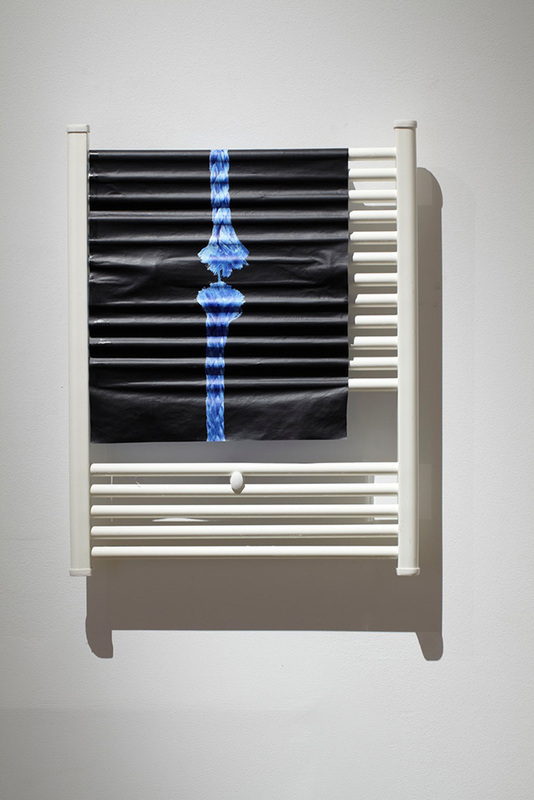 In her earlier work she printed them as large, simplistic images, dipped them in glue and draped them across everyday objects such as radiators, to dry. Recently she has taken a more 3D approach, using real items to recreate the images themselves and then dropping them into water. Suspending a mundane object such as a white mug with copper coins pouring out of it, in an oversized, apparently full, cocktail glass, she creates a sense of movement, a trait employed by stock image creators in order to set their image apart from competitors. The artist explained how her fascination for the history of the object and the image is something that she continues to explore in her latest work. We were given a brief preview of a piece from ‘Cash For Gold’, which opens at the Kunstverein Hamburg next week. 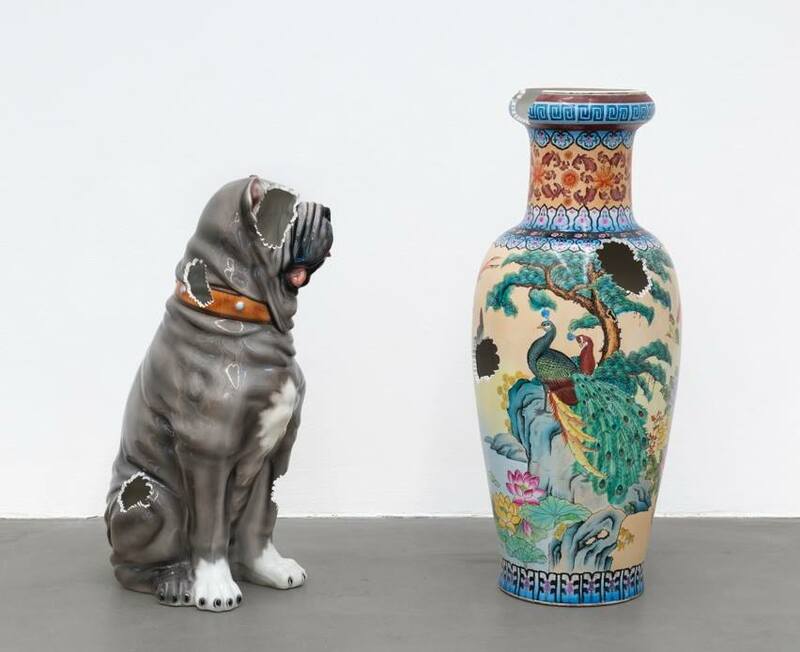 A painted porcelain figure of a dog is positioned next to a to a vase. Whilst both are made from the same material and in a similar style one was produced in China and the other in Italy. Each of the items have bite-shaped sections removed from them. The missing pieces create visual threads that link the two together. 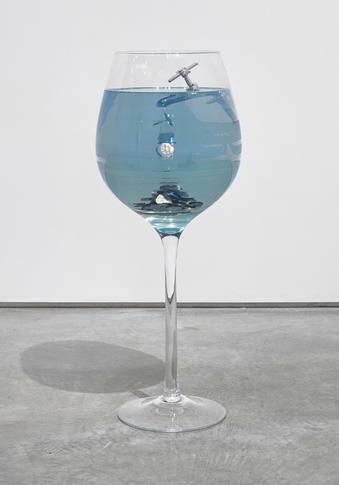 The work of Nina Beier is in many ways difficult to fault. Carefully conceived and elegantly executed it is bolstered by philosophical thought and critical social comment that strive to make it relevant in a disorientated era. An archetype of the art of our time: whilst the work looks and sounds theoretically good, the repeated use of readymade aspects make it ultimately feel anonymous. Last week ‘Are you series?’ opened at Philara Düsseldorf, displaying over a hundred works from 28 artists all in one room, the exhibition is aptly named. 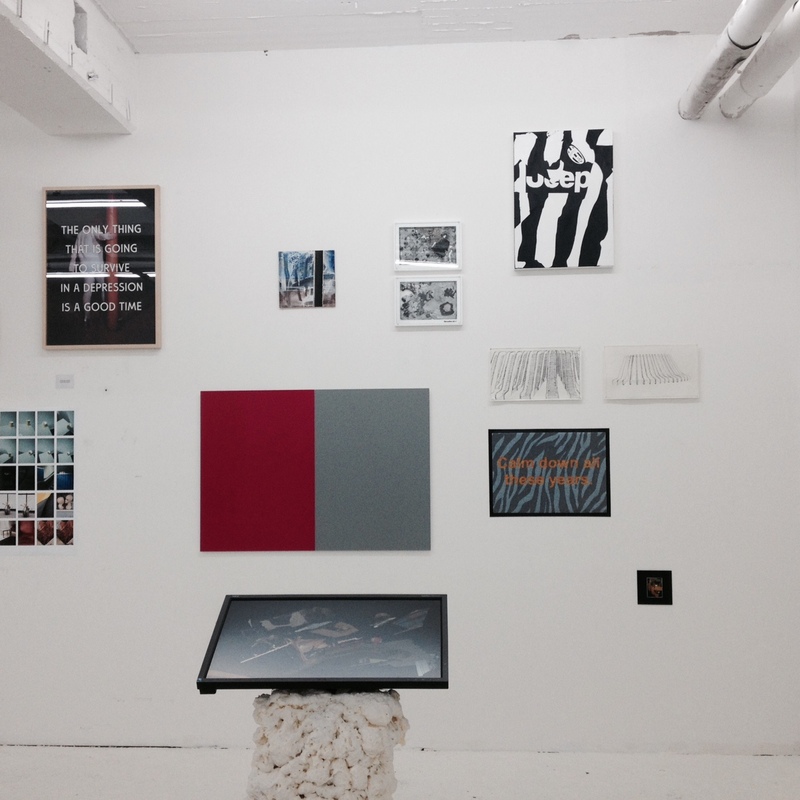 The featured artists are students of Professor Johannes Wohnseifer at the Kunsthochschule für Medien Köln (KHM.) Together they have created a show that turns the notion of serial art on its head. Whilst each of the artists have produced a series of works these are displayed in a far from traditional manner. Rather than showing each series as a unit the works have been separated and spread across the room to intermingle with one another.Treating the output of 28 artists as a uniform series could have gone seriously wrong, especially when such a range of techniques and materials have been used. However ‘Are you series?’ skilfully juxtaposes a huge variety of works in order to highlight their individual strengths. Take the work of Lukas Johannes Heerich’s who has stretched large pieces of beige fabric over frames so that they each feature a single fold. Whilst their minimal elegance allows them to stand alone they are surrounded by other works that add to their aesthetic appeal. The grafitti-inspired pictures of Severin Humboldt which flank one of Heerich’s canvases could not be further from their neighbour’s simplistic style; created from a mix of digital mediums Humbodt’s colourful inkjet-printed pictures feature images of brick walls with slogans such as ‘Smoke some weed’ sprayed upon them. Although the juxtaposition is obvious it is not intrusive, the contrast in styles serves to highlight the strong points of each. ‘Are you series? avoids over-crowding by establishing key focal points throughout the room. The gallery space is a white-washed warehouse whose pillars, rather than obstructing the perspective have been incorporated into the layout in order to orientate the viewer. 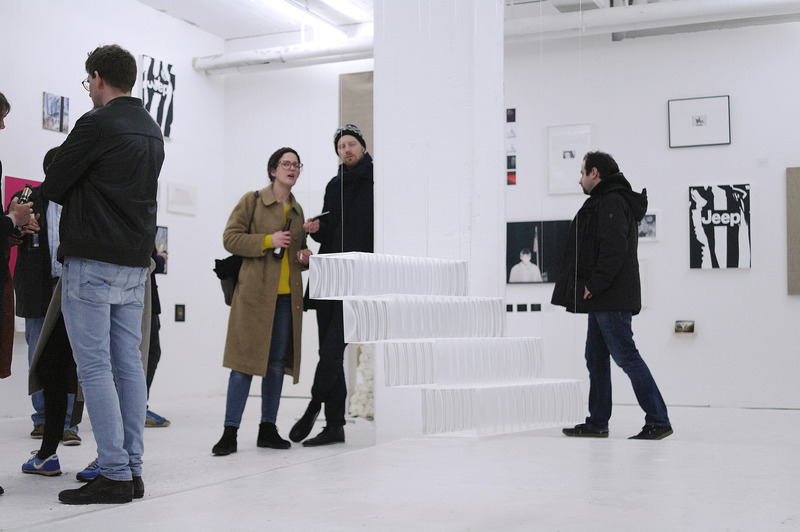 At the centre of the room are Roman Hahlbrock’s ‘Shritte’, a set of see-through, 3D-printed steps which suspended from the ceiling, act as an abstract view-finder through which the rest of the exhibition can be observed. By challenging visitors to piece together the deconstructed series themselves ‘Are you series?’ demands engagement. The show overcomes its size with an arresting layout and a sharp sense of wit that leave the viewer feeling refreshed rather than overwhelmed. ‘Are you series?’ is on at Philara Düsseldorf until 10th May. 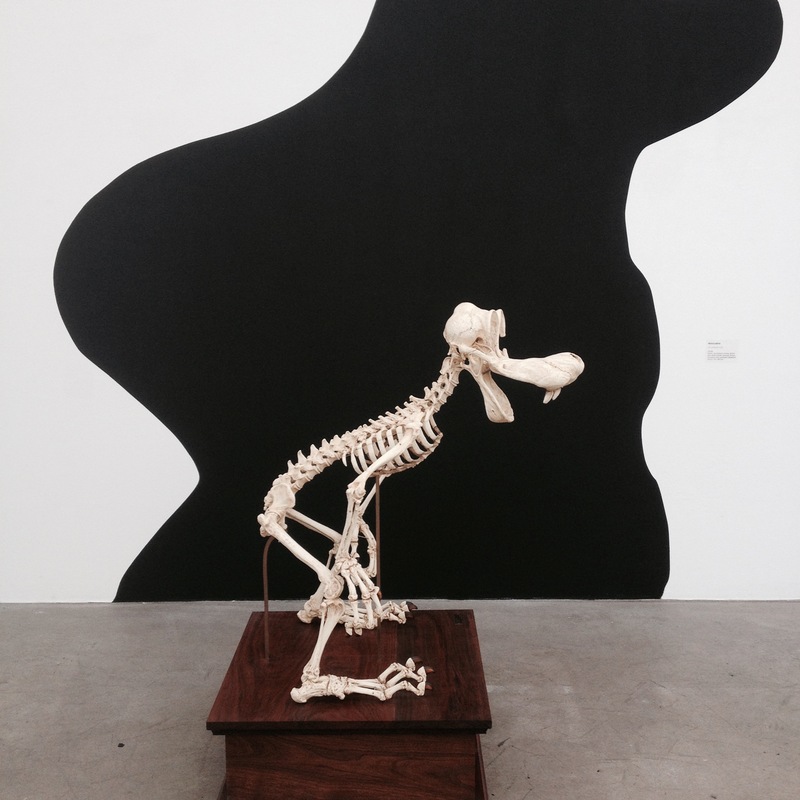 Last week a major solo exhibition of German artist Anna Fasshauer opened at Galerie Nagel Draxler, Cologne. 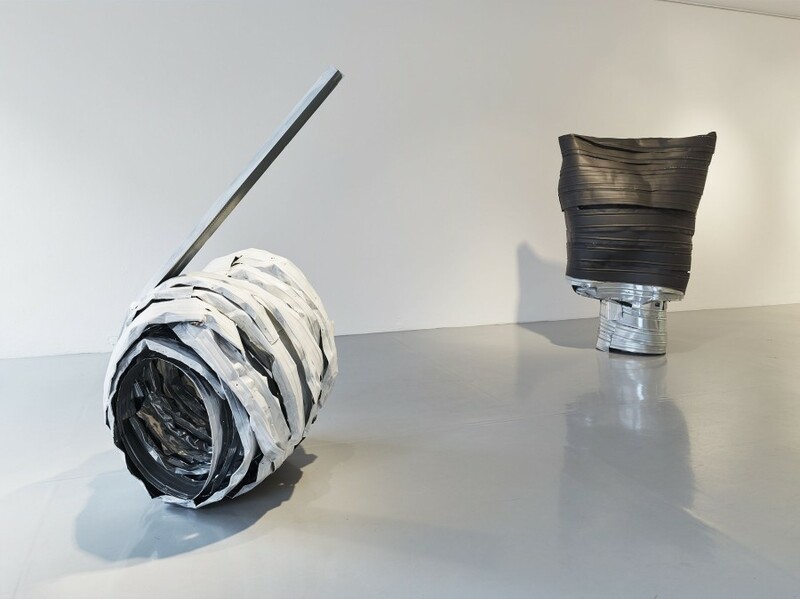 Fasshauer is a Köln-born, Berlin-based artist who operates outside the lines, exhibiting internationally since 2002 she is best known for turning burnt cars and carpets into refined sculptures. It is therefore not surprising that in ‘Sollte,sollte, sollte, könnte, müsste’ she has managed to work with metal as if it were putty. 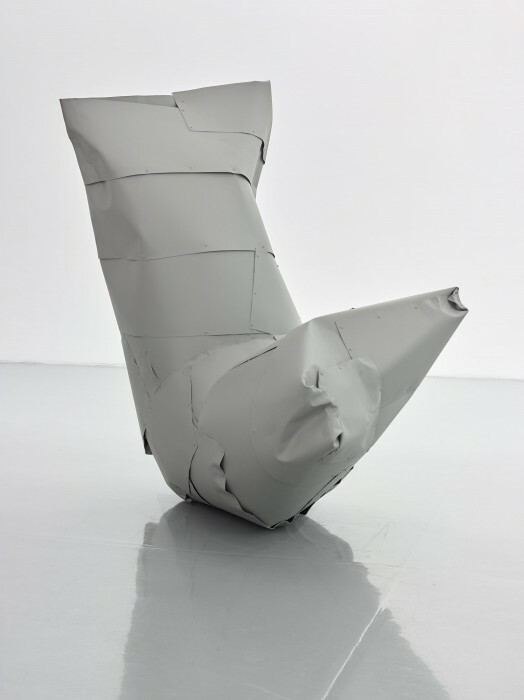 For her new series of ‘essayistic sculptures’ Fasshauer has manipulated stainless steel sheets and dry wall construction profiles into such elegant shapes that they appear to have been as easily bent as if drinking straws. 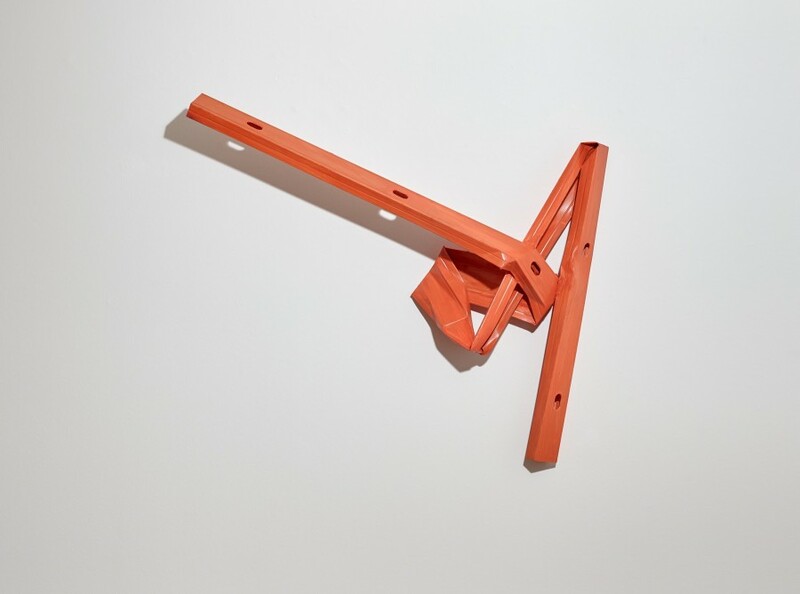 Behind Fasshauer’s work however, lies an intense physical process; she works alone and with her ‘bare hands.’ Following a ‘stream of consciousness’ Fasshauer forces the metal into intuitively precise forms. 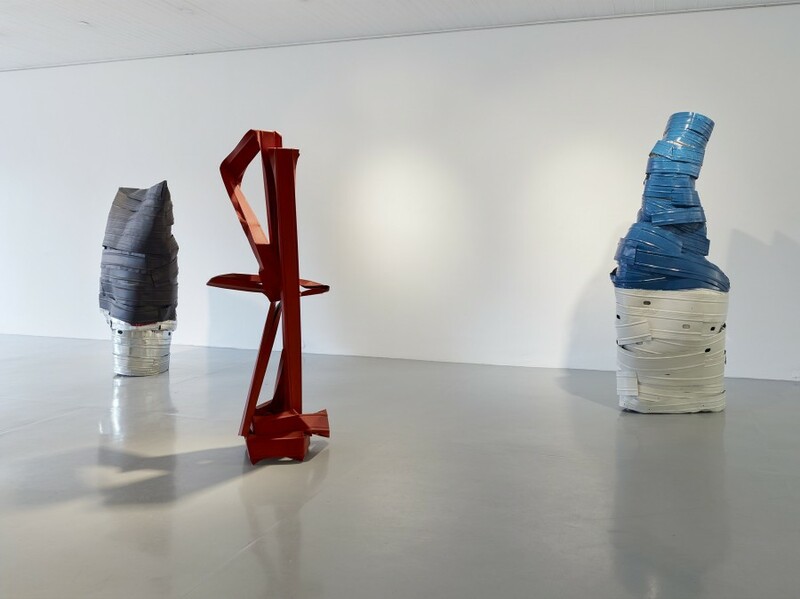 The floor sculptures and wall works are spread across all three levels of the gallery and whilst their strong colours and sharp contours create a determined presence they possess a certain delicacy that prevents them from being imposing. Fasshauer’s sculptures draw the eye towards possible outlines, their brutish presence giving way to potential new form. It is this suggestiveness that makes the work so powerful, the bright colours rather than overwhelming, serve to highlight the subtler aspects of these large abstract forms. ‘Sollte,sollte, sollte, könnte, müsste’ confronts the viewer with a sense of untamed elegance, the nature of which allows the works featured to possess endless interpretations. It is Fasshauer’s ability to create infinite lines from unyielding materials that makes this exhibition so unique. ‘Sollte,sollte, sollte, könnte, müsste’ is on view at Galerie Nagel Draxler until April 04.